"Pray What God Says" is a valuable resource that will help the believer gain a deeper relationship with Jesus Christ through prayer. Learn how you can: Develop unbroken communion and fellowship with God; Experience the manifestation of blessing in every facet of life by declaring the scriptures over your circumstances; Pray effectually for spiritual growth, family, health and finances for yourself and others; and Intercede to win souls and add to the body of Christ. 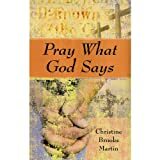 For a limited time, download eBook bestseller "Pray What God Says by Christine Brooks Martin in the Amazon Kindle Store. Learn how you can: Develop unbroken communion and fellowship with God; Experience the manifestation of blessing in every facet of life by declaring the scriptures over your circumstances; Pray effectually for spiritual growth, family, health and finances for yourself and others. "Christine's Short-Shorts" is a collection of stories and poems to inspire and encourage the reader. They reflect the love, compassion and faithfulness of an Almighty God who reveals Himself to His sons and daughters in so many facets, so you can: Understand the keys to living a victorious life; the importance of yielding to the Holy Spirit; and the power of embracing your Kingdom identity and its benefits.